Fred T. Baker (born in Tibshelf, Derbyshire, UK, 4 June 1960) is predominantly renowned among Canterbury music fans for his work with Phil Miller's In Cahoots and his duo album with Miller, 'Double Up' (1992). 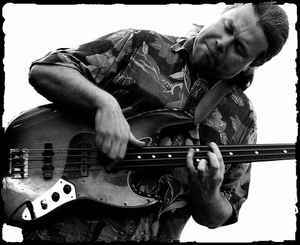 But this outstandingly talented bass player is also a highly respected musician on the British jazz and folk scenes. He was member of following bands: John Etheridge/Ric Sanders Group (1980-81), Fred Thelonious Baker Group (ca.1984), Harry Beckett Group, Elton Dean/John Etheridge Quartet and Baker/Parlan. Currently he is a member of 'In Cahoots' and 'Pip Pyle's Bash'. In addition to performing and recording, Baker also teaches jazz and progressive music at the Birmingham Conservatoire of Music.